Take the Karasuma Subway Line from Kyoto Station to Karasuma Oike, and take the Tozai Line from Karasuma Oike to Kyoto City Hall, and walk approximately 5 minutes (400 m) to the shrines. Take Kyoto City Bus routes 4, 17, and 205 from Kyoto Bus Terminal to Kyoto City Hall and walk approximately 1 minute (140 m) to the shrines. Cross Sanjo Ohashi Bridge and walk north along Kawaramachi Dori for approximately 10 minutes (700 m). Walk west along Marutamachi Dori and then south on Kawaramachi Dori for approximately 10 minutes (700 m). Walk north along Kawaramachi Dori for 15 minutes. The shrines are a one-minute walk from Kawaramachi Station. 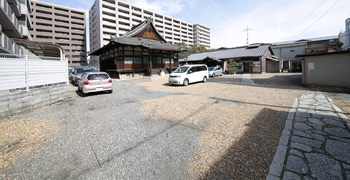 Take Kyoto City Bus routes 3, 4, 17, 32, and 205 from Shijo Kawaramachi to the second bus stop Kyoto City Hall and walk for approximately 1 minute (140 m) to the shrines.